For all who asked for an easier and more user friendly way to find and view our videos on the site, we’ve created a video button on the far right of the header of the front page labeled VIDEO. Give the page a look and just click to play any of the top five videos listed on the page. Additionally, all of the video titles will appear in the sidebar and may be viewed by choosing the title and then selecting click to play. Cheers! This entry was posted in news on February 26, 2007 by Theaux Le Gardeur. Chota’s STL+ boot is the best fitting and most comfortable wading boot on the market. We use them in exclusively in the guide service and as rental boots for occasional anglers.This versatile quick-lace boot has introduced more anglers to a removable cleat system then any other boot on the market. This entry was posted in gear, reviews on February 26, 2007 by Theaux Le Gardeur. Gunpowder State Park officials DO have clearing the parking lots along the Gunpowder River on their work schedule, although at this point the rain coming in this evening through tomorrow, coupled with warmer temps, should alleviate the parking woes experienced over the weekend. Today, the Masemore lot is in the best shape, while upper Falls Rd., lower Falls Rd., and York Rd. lots are the worst. The stream gauge is at 75 CFs today, but it should be moving well into the high 100’s as the snow and ice melts and more spillover occurs. Water temps are still on the cool side at 38-40 today F and will be warming by the weekend as surface water from the reservoir displaces snowmelt along the banks. Stonefly nymphs are still worth a shot, especially in the shallow riffles. Try micro-nymphing with bead heads pheasant tails in the #18-22 range and plan on prospecting a bit before you find some willing fish. When you find them, they will be stacked up, so fish a little slower, until the water warms up a bit. I was out fly fishing Saturday and thanked my lucky Chota Stl+ boots for keeping me upright. Waiting for unbridled dry fly action? We should start to see some little black and early brown stonefly adults in the #14-16 range as the water temp reaches the mid to high 40’s, perhaps as soon as this weekend. -Thanks to Jason du Pont for another great Gunpowder River photograph. This entry was posted in fishing report on February 20, 2007 by Theaux Le Gardeur. I have to agree with Bill about the large dogs. They can be real irksome. I think they scare horses, too. I know mountain bikers scare ’em. Plus, I was speaking with a woman I know who lives near the river and rides there. I told her what was happening on this site – the talk about horse damage. She was very upset. Not about what is being said but about the possibility that “troubles are a-brewing.” She knows what damage a horse can do to a trail; she says she has been riding there for years and has probably contributed to some damage herself in the past but she says that she and her friends ride well back from the river FOR JUST THAT REASON! She was visibly upset about this issue because she wants to maintain the privilege of riding there and sure doesn’t want to get into any hassles with the fishing crowd. I think we have an ally there and I’m sure she’s spoken to her other riding friends, but, as we all know, a lot of people ride there. I thought it was at least nice to know that this person is concerned also, understands our point of view and will hopefully pass the word along to some others. Unfortunately, they are already riding well back from the river so it’s like preaching to the choir! She also noted that she has never heard of nor seen anybody clearing trails of blow-downs of cutting any trees to make way for horses, and promises to let me know if she does. I got a lot out of that conversation with her. I guess that’s how a lot of us get involved, though. We find that through mere conversation we’ve become accidental activists! This issue promises to become a hot topic, I’m thinking. This entry was posted in news on February 19, 2007 by Theaux Le Gardeur. If you need a solid backup rod or have been looking for a quick and light travel rod the A2 may just be the ticket. Priced just under $300, this rod is ideal for small to medium sized mid-Atlantic streams and is a great addition to your quiver. This entry was posted in gear, reviews on February 16, 2007 by Theaux Le Gardeur. More anglers have switched over to this 4 piece 3wt this season than all of our other 3 wt rods combined. Frankly we’re running out of 3 wt lines because of the popularity of this rod. Great touch, packable and very light in the hand-next time we’re faced with low water-I’ll grab this rod first. On Feb. 16, 2007 Theaux added the following:Spillover this week has brought the river flow up to 145 CFs and it is dropping now to the low 100’s. Today all access points are now “plowed in” –read no access–from Upper Falls through Bluemount Rd. We will be speaking to Gunpowder State park officials today about when the lots will be cleared and will keep you posted. The air is colder than the water, at least the water that’s moving. Just ask the fish! The Gunpowder river is flowing at 58 Cfs and all of the access points are open. The river has lots of edge ice along the banks from Masemore through Falls Rd. Falls Rd to the dam has open water in pockets, but should be especially tough to cover if we get more snow. 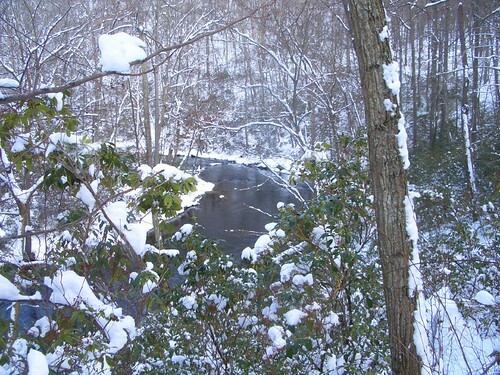 This picure, taken by Jason du Pont just upstream of the high trail pool, is a typical Gunpowder River winter scene. Snowflies, little Black stones and small bead head nymphs are worth a shot but plan on walking the trails a bit before finding open water. With snow in the forecast, we should have more spillover as everything melts away in the next week or so. Stay Tuned! This entry was posted in fishing report on February 12, 2007 by Theaux Le Gardeur. Theaux– Here’s what I saw on the trails. I hope passing it on to DNR with other people’s observations helps improve the trail conditions. I was fishing the Gunpowder on the 15th of January. I walked from York Road to about a half mile above Bunker Hill Road. On the north bank trail above the big pool ,above the Bunker Hill access there were 2 or 3 places where the trail had become mired in mud. I don’t know what the cause of this miring is, but it certainly was a deterioration of the trail. This entry was posted in news on February 11, 2007 by Theaux Le Gardeur. Yes it’s cold out there, just remember that the Gunpowder River is a tailwater that provides excellent fishing during the Winter because the flows coming out of the Dam are typically in the low to mid 40’s.I accompanied Jason du Pont, who is getting to be well know for his video work, and Stacey Smith, who also guides for the shop on this recent outing and had a ball. 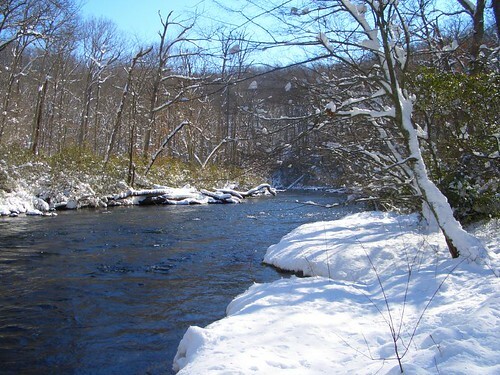 Cold weather doesn’t always mean slow fishing on the Gunpowder as this video short shows. This entry was posted in video on February 10, 2007 by Theaux Le Gardeur.